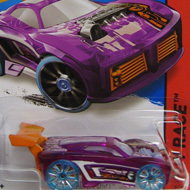 7/250 is part of the HW City series and the 2015 Treasure Hunt set. 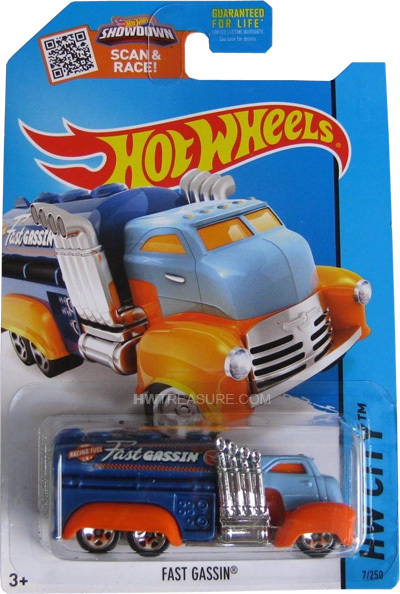 The tanker truck has a light blue cab and a metalflake blue tank with “Fast Gassin” amd the low production symbol on the sides. It has an orange interior, orange fenders, 5-spoke wheels, and a chrome plastic Malaysia base. 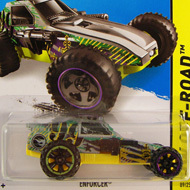 The truck first appeared in the 2009 New Models series. It is a smaller tank truck modified with four chrome exhaust stacks on each side.